On the path of sustainability – with this motto, the mountain sports and cycling outfitter VAUDE, wishes to encourage athletes to take care of their environment. Those who wish to pursue a path of sustainability while enjoying the great outdoors can find many ways to reduce their ecological footprints while doing so. VAUDE provides gear with its own in-house Green Shape Label that does just this, proving just how sustainable functional apparel can be. Starting this Spring/Summer 2018 season, almost the entire VAUDE Apparel collection bears the Green Shape Label and is completely PFC-free, meaning that no harmful fluorocarbon compounds were used in the manufacturing. At German outdoor brand VAUDE sustainability is the "common green thread" that runs through the company. Product developers here are constantly tackling the question of how to make functional clothing, shoes and backpacks environmentally sustainable. Since the topic is so complex and involves so many choices in terms of materials, manufacturing processes, energy consumption, chemical processes and, not least, social factors, VAUDE has developed its own in-house Green Shape Label, a comprehensive catalog of criteria that ensures that all functional products bearing the label have been manufactured as environmentally friendly as possible. VAUDE, as a member of the Fair Wear Foundation (FWF) with Leader status, ensures that all garment producers are regularly monitored by the independent organization ensuring that production is carried out under fair conditions. In its Spring/Summer 2018 collection, VAUDE has succeeded in completely eliminating environmentally harmful fluorinated hydrocarbons (PFC) from all its apparel. Thus, the southern German outfitter meets the voluntarily signed detox agreement with Greenpeace. With regard to the whole apparel collection, this means: 100% PFC-free membrane and water-repellent treatment! These environmentally friendly PFC-free alternatives have been put through numerous tests with different materials and have met performance requirements. "Our customers expect a rain jacket that repels water and dirt, and a material that does not soak up water on the outside. Different materials also react differently, so we have to check each substance individually, and have developed testing methods that go beyond conventional industry standards" Hilke Patzwall, VAUDE CSR-Manager explains. In addition, the new collection includes numerous alternative materials such as recycled polyester made from PET bottles, the wood fiber Tencel® or drirelease® wool. The bluesign® system is another important criterion for a Green Shape product. Similar to a purity law, it focuses on issues such as strict chemical management and energy efficiency. Real outdoor men and women can be found out and about, no matter what the weather may be. 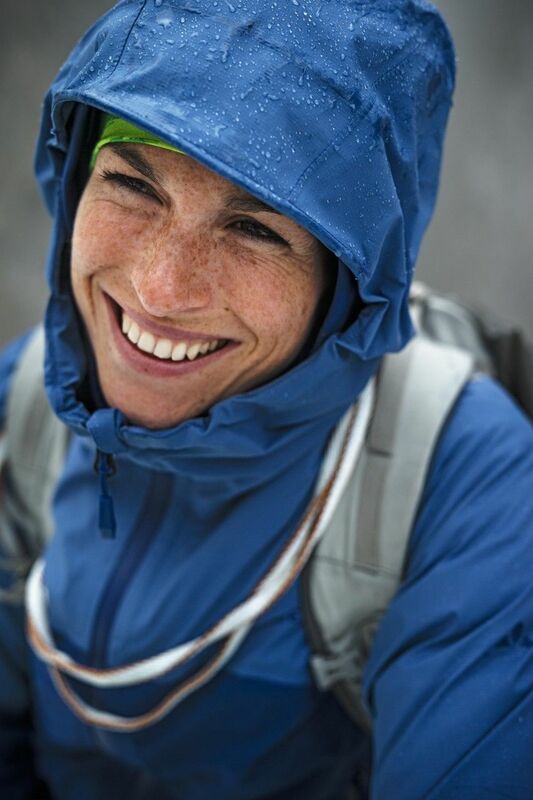 Perfect protection from Mother Nature’s whims – while conserving her resources – is what the new Skarvan Jacket for trekking or the technical Simony 2.5 L Jacket for alpine tours promises. These jackets combine freedom of movement and best comfort, with environmentally friendly innovation, and pack down small and light enough to fit comfortably in any backpack. The jackets are equipped with a waterproof, windproof Ceplex Green membrane. The new environmentally friendly membrane is 100% PTFE-free and PFC-free. VAUDE also uses up to 25% recycled or biobased materials in its production. Even the water-repellent Eco Finish treatment of the outer shell is completely PFC-free.